OXFORD Fine Arts Festival | Oxford Maryland Vacations! Oxford, MD – The Oxford Community Center is proud to announce Steve Rogers as the featured artist for Fine Arts @ Oxford 2018. His painting entitled “Raptors” captured the eye of the anonymous juror, who was charged with the selection, and awarded this honor. Detail and more detail, light, and structure are all apt descriptions one understands of Steve Roger’s works when first seen. Whether they are maritime scenes, old farm structures, landscapes, or even ship models, they capture the real-life moments of a working coastal life. Steve has an expert understanding of the internal structures, primarily of boats, that he realistically brings into each of his paintings. His years building ship models, publishing, and teaching model building at the Wooden Boat School in Brooklin, Maine further developed that skill that so clearly defines Steve’s work. He considers himself a Brandywine School artist and enjoys American impressionism. Steve has been a signature member of the American Society of Marine Artists for many years which is a nationally recognized organization specializing in marine art. Steve has lived and worked in Lewes, Delaware for close to 20 years and is an active leader in the Delaware and Rehoboth-Lewes arts community. 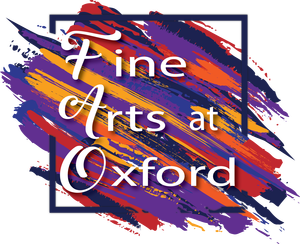 For 34 years, Fine Arts @ Oxford has been the Oxford Community Center’s biggest, most visible event. Roughly 1,000 people come to Oxford over the weekend from throughout the state, Washington, DC, and the region to see the 39 juried artists exhibiting and selling their Fine Art. The competition was steep this year with 15% more applicants and 16 new artists gaining acceptance. Every year there is a fresh, yet consistent show for art enthusiast which creates loyal attendance and growth each year. The weekend kicks-off with the gala preview event Friday, May 18th at 6:00 p.m. consisting of heavy hors d’oeuvres, refreshments and the main attraction of meeting the artists and gaining a sneak peak of the artwork. Saturday, May 19th the exhibit is open 10:00 a.m. – 5:00 p.m. and Sunday, May 20th resumes at 10:00 a.m. but concludes at 4:00 p.m. Light lunch and refreshments will be offered, including famous homemade strawberry shortcake both days. The juried exhibitors are available during all open hours for conversation and demos. There are raffle drawings of artwork generously donated by the exhibiting artists and a “toast of bubbly” to wrap each day. It is truly an exciting event and generates critical revenue, which allows OCC to offer free and low cost programs throughout the year. One of the keys to Fine Arts @ Oxford’s success is the support of sponsors to help underwrite the event, making the money raised by the event go directly towards serving our greater community. To learn more about Steve Roger’s process and see some of his works, visit his website at www.marineartbysteverogers.com. Tickets for the preview gala are $80. Saturday and Sunday are $7. For more information on sponsor opportunities, or to purchase tickets, please contact the Oxford Community Center at 410-226-5904, or email oxfordcc@verizon.net, or visit our www.oxfordcc.org. Sign up for OCC’s weekly e-newsletter for additional announcements and updates and like OCC’s Facebook page at Oxford Community Center, Inc.